Emotional research is a key component of sensory research. Understanding consumers emotions and feelings towards consumers goods is the key to developing successful products. When consumers experience a product, their emotions are triggered by the senses. The emotional response underpins much of the rational outcome and judgment of the product, although much of it may be unconscious and poorly controlled by reason. The emotional response (how someone feels about a product) brings in past experiences and the system of values and beliefs of the individual. Although emotions are a fundamental dimension of product experience, they have been largely ignored by product developers because of the lack of quantitative and objective tools to assess the emotional response in a way that leads to the specific choices for product attributes. SRL team has 10 years experience of systematically assessing, describing and quantifying the emotional response to product use and apply tools and techniques that they continuously perfect to achieve this very demanding objective: translating fuzzy and ill-defined feelings and emotions into objective choices for product design factors. The most successful products are direct result of understanding the consumer emotions. SRL is one of the few companies that has working experience with state of the art methodologies such as Kansei engineering. Kansei engineering (or emotional engineering), is a product design and assessment method emerging from Japan. It is an expert system that translates the human images or feelings regarding a product into product design elements. Kansei has been applied successfully in wide range of industries including automotive, electronics, textiles and food products. 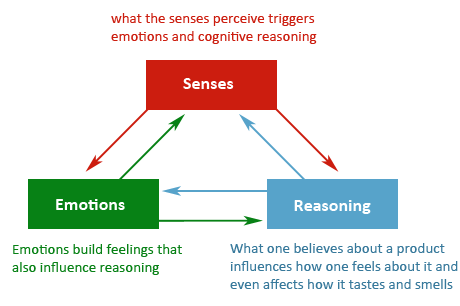 SRL’s Sensory Emotional Synergy (SENSES) expert system utilizes a series of tools including focus groups, sensory evaluation and emotional research techniques. 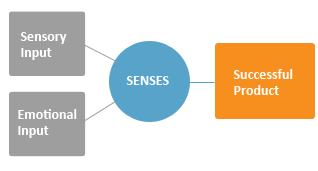 SENSES is a cornerstone of SRL’s Product Design Engineering approach. Which product attributes can trigger specific emotions. How to optimize your product in order to meet your consumer emotions and expectations. How to increase your market share. What are the emotional and sensorial attributes of my product category. It has been used in order to identify key consumer emotions that can bring out consumer satisfaction. To elicit consumer satisfaction, is to satisfy their emotional and functional expectations. SENSES links the sensorial and functional input of the product with the emotional response of the consumers. Product Design Engineering is about developing a product that by design will stimulate the intended reaction in the user: satisfaction. That will result from a combination of sensory, emotional and rational responses to the experience of using the product. PDE requires an understanding of the relationship between the factors (product attributes and respective design choices) and the performance, that is, the consumer response (sensory, emotional, rational). Everything needs to be considered: product formulation, package, price, marketing image, etc. Everything is integrated and everything is interlinked! To engineer a product that will stand out in the crowd and satisfy the target market we must understand the integrated system as a whole. By applying our Sensory research, Emotional research and Reasoning tools and integrating the results, we have developed a knowledge system that translates the consumer and marketing targets into design choices for the product. This requires actual data by performing field trials with consumers and sample evaluation by our highly trained panels. SRL applies effective experimental design techniques to ensure time and cost effectiveness. Our PDE approach is tailored to the marketing targets, company strategic objectives, market realities, competitiveness and consumer needs and demands, so that the most appropriate tools can be used effectively and the synergistic combination can be meaningful and result in objective decisions on which design choices are the best.